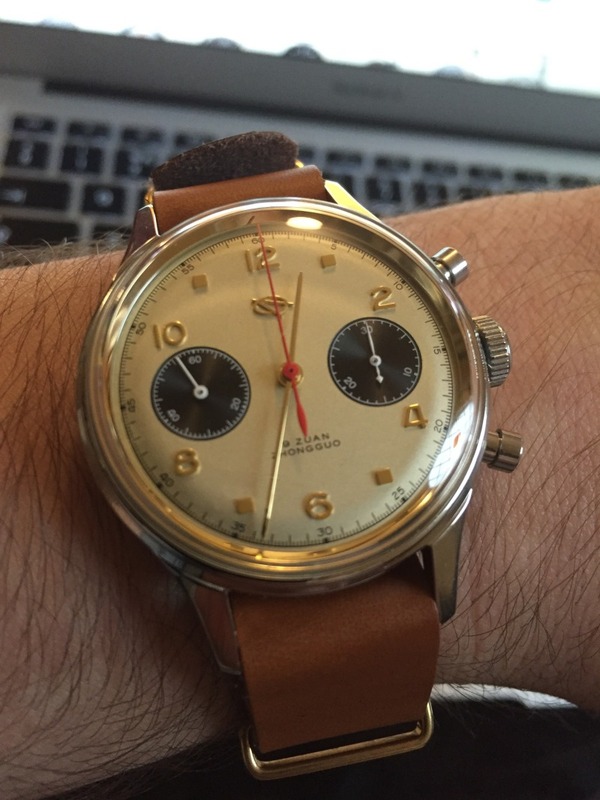 The Seagull1963 chronograph is an affordable watch that is very popular on the watch forums. I spent a week wearing this example, which I purchased from HKED on Watchuseek. There are a few versions of the watch, in both 38mm and 42mm, and with slightly different features. 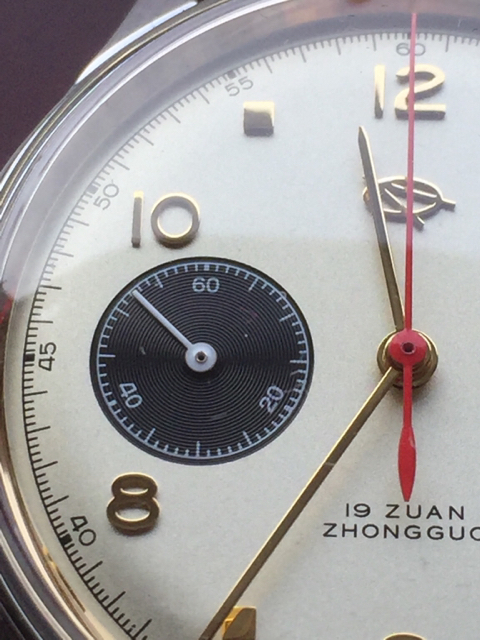 The watch itself is an official reissue of a chronograph that was worn by Chinese pilots. It was originally produced by the Tianjin Watch Factory, which in 1961 was already famous in China for producing the first Chinese-made watch. The factory was commissioned to produce the first Chinese chronograph watch for the Air Force of the People’s Liberation Army. The Tianjin Watch Factory received permission in 1963 to mass produce the watch, and 1400 examples were made for the Chinese Air Force. The Seagull Chinese Air Force watch features a hand-winding chronograph movement with 19 jewels and a power reserve of 40 hours. The Seagull movement is reliable and accurate. The subdials show running seconds and elapsed minutes. As with all mechanical chronographs, the minute dial only counts 30 minutes, as it would otherwise be impossible to read accurately. 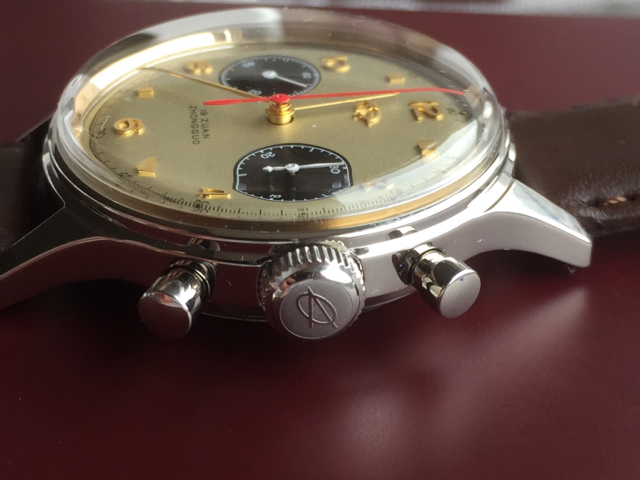 It is worth taking a few moments to look at the movement, which in this example is visible through the case back. The watch usually comes with a choice of a solid or glass back, and I cannot recommend enough that you choose the open version. The movement is a piece of art, and the watch looks just as good upside down as it does the right way up! 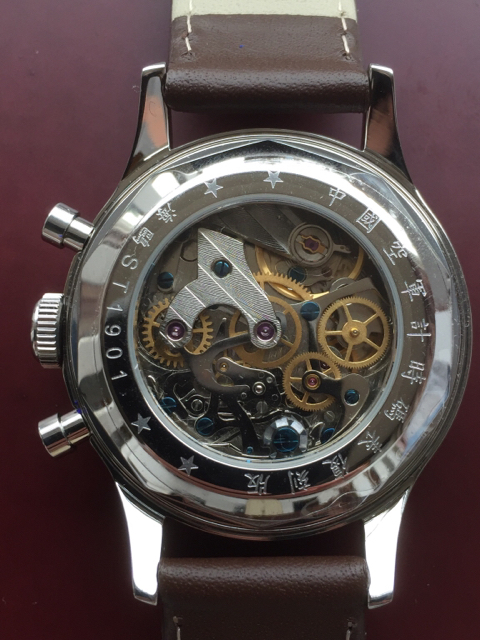 The movement is nicely finished, and although I cannot read the Chinese text surrounding it, it is etched to a high standard. It’s not a high-accuracy modern movement, but it exudes vintage charm and is as expected for a mechanical piece. The supplied strap is adequate, but nothing to write home about. I would recommend switching it out for a good quality tan leather NATO strap to give it a military feel. These are readily available from eBay or dedicated suppliers. We recommend the Ague Trading Company for your NATOs. 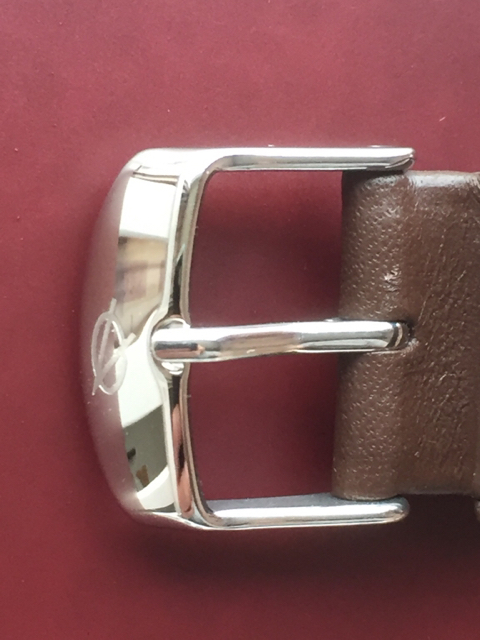 The buckle on my example is laser-etched with HKED’s logo, but I was not too impressed with the buckle and would not seek to retain it when changing straps. The dial is stunning. The standard watch has a cream dial and cream sub-dials with blued hands. HKED’s version comes with a choice of black and cream, and you can swap out dials to create a ‘Panda’ effect. I opted for cream dial with black subdials and gold hands which I think looks brilliant. The finish on the dial is superb, even in close-up. The HKED Seagull 1963 has square hour markers rather than the standard reissue’s wedges, and a logo which is apparently closer to the original watch than the star design on the official remake. A particularly nice touch is that the ring between the dial and the case is gold. It sets off the watch beautifully without looking too audacious. The case is nicely built, and the pushers are firm, making a positive click when they are engaged. The domed acrylic crystal looks great and suits the vintage style. Some prefer scratch-resistant glass, but acrylic can be polished with Polywatch and is much cheaper to replace. I love the vintage look of acrylic but it can be impractical – more on this later. The crown is signed with a logo that matches that on the dial. Overall the watch feels and looks like it cost a lot more than the £200-£300 you will pay for a new example. The only criticism I have of the case is that I would prefer ‘lug holes’ to make strap changing easier. This is the kind of watch that really benefits from having the strap changed, and easier access to the spring bars would increase its versatility. So what’s it like to wear? I wore the watch exclusively for a full week in order to test it out in real life situations. The first thing I noticed was the size. 38mm is small by modern standards, and the watch does feel incredibly compact and light, especially because it is worn on leather and not a bracelet. I am comforted by the slip and slide of a bracelet down my arm and often forgot I was wearing the watch. The problem for me with the small size is that with the acrylic crystal it feels like it is extremely thick. This is an optical illusion, as it is no thicker than many other watches (and nowhere near as thick as a watch packing an ETA chronograph movement) but I did find myself knocking it into things. I struggled to fit it satisfactorily under a shirt sleeve. It’s easy to read in the daylight – especially with my choice of dial, but the lack of luminous markers is noticeable in the dark. I also struggle with watches that do not have a date feature (although I accept that a date window would ruin the look of this watch even if the movement supported one). My overall thoughts are that this is a truly beautiful watch, which is well-made and oozes quality. It is extremely versatile if you are prepared to switch out the strap. Timekeeping is exemplary, and the chronograph functions well. However I just could not get past the lack of date, the small size combined with the thickness, and I don’t think I would pick it out of the watch box ahead of a more modern chronograph, or a thinner dress watch. 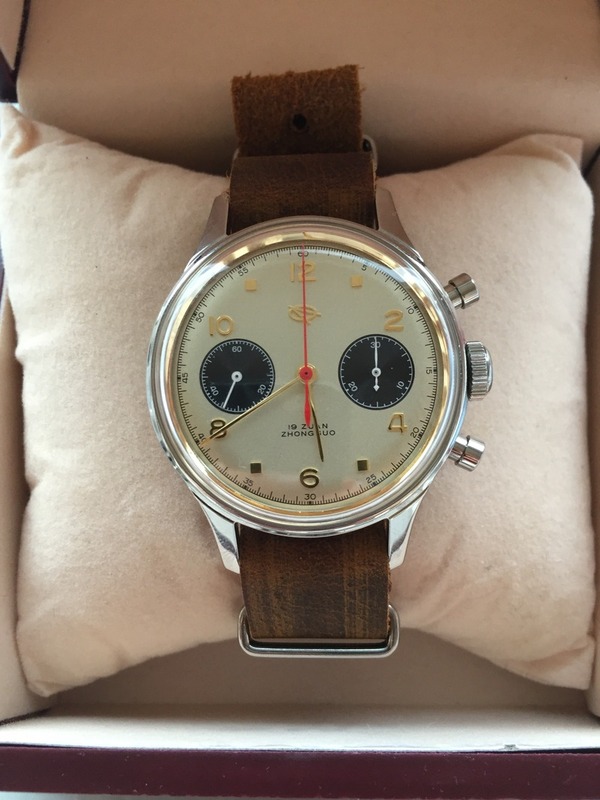 Where to Buy a Seagull 1963 Chronograph? We have bought a Seagull 1963 watch from Watch Unique in the Netherlands but they stopped responding to our emails when we had a problem, so we recommend forgetting about after-sales as these watches are pretty reliable, and using the Chinese seller we found on eBay. Click here to find a Seagull 1963 for sale on eBay, from a new seller that is offering them at a lower price than our previous best picks Watchunique and Poljot. They also have stock of the exact model in this review at £209.